In the usual OSL style of attempting make your life easier, On Stage Lighting takes a look at “Magic Sheets” in performance lighting, their development and how the concept can be used with modern lighting control platforms with some specific examples using the Cham Sys MagicQ. What is a Magic Sheet? Although I have heard the phrase “Magic Sheet” used for a few different things, in lighting the term commonly refers to a cheat sheet for the Lighting Designer that is created for a specific purpose: To speed up the business of recalling control channel numbers for areas, colours or jobs around the stage. 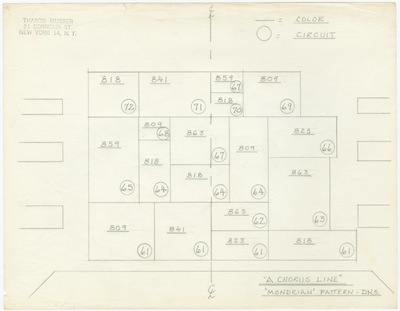 The Magic Sheet differs from the Plan (or Plot, in the US) in that although a graphical document, the sheet is not an accurate representation of the theatre or the rig but a sheet of shapes, hieroglyphs, numbers and other visual data set out to provide intuitive and fast access to the required information. Let’s look at the development of lighting control while understanding what the Magic Sheet is and what it can be now on our way to Smiffy’s Minority Report future. At some point during the work of creating performance lighting, however artistic and visually creative a Lighting Designer wants to be, there is the business of calling up channels of control during the setting up of states or cues. Originally this was the “Channel 48 at Full, Channel 1 through 7 at 30 percent” world where each lantern or a pair of lanterns has an individual number of dimming control that needed to be set to an intensity level and recorded. Originally this was just documented and later recorded for playback using new fangled “memory” lighting desks. The trouble with all these handles and numbers is that it’s hard to remember which does what as the channel count increases. In order to recall these numbers and having spent many an hour pouring over the Lighting Plan and reading out seemingly random channel numbers from their position on the drawing, you might find space on the Plan to write down some “groups” of channels that will be used together e.g Warm DS Front = 1,3,7,19, 20-23. If you have the option, you can attempt to patch your rig in such a way that makes recall of the numbers easier: Warm Front is 1 – 7 , Cool Front is 8 – 13 whatever. This helps you reel off the various numbers without so much “plan-scouring” but is still written in a list format that you have to wade through in order to find out which set of numbers are your US toplight. In steps the Magic Sheet. Laid out in a variety of formats to make visual sense, dispensing with lantern symbols and scale, the Magic Sheet puts usability at the top of the agenda. It may be divided up by stage area, colour groups or angles of incidence and each LD seems to have their own preferred method of laying out a magic sheet. Some LDs use colours on the sheet itself, although for me this always comes unstuck when you are squinting by the light of a blue-gelled anglepoise with scarcely better colour rendition capabilities than that of a sodium car park lighting scheme. The only rule of creating your own Magic Sheet is that it must work for you. Having already noted that our lovely little lanterns often like to work in teams and listed the team members as a “group”, we developed parts of lighting controls to deal with these. They became Groups as we know them today: “Can I have Group 3 at 50% please?” is great if you know that Group 3 is your Blue Wash or your Balcony Rails. 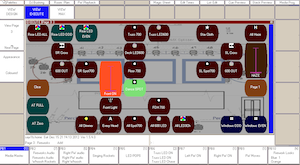 Calling up handfuls of control channels on the next generation of lighting controls becomes a little easier and so instead we not only include channel data on the Plan and Magic Sheet but also Group numbers, ready for instant recall. Next consoles developed to be controlled in ways that enabled more than keypad number entry of Groups. Hard buttons were able to have Groups assigned to them to be labelled with PVC tape and Sharpie which lends itself to graphical hieroglyphs and Names eg. All Blue which could be laid out on the available buttons in a manner that made sense to the programmer. Perhaps you always put your FOH stuff to the left of the Stage or laid out your group selection buttons according to the real stage picture in front of you. It’s worth noting that the ease of use afforded by some of the console interfaces and hands on nature of touchscreens and hardware buttons gives the LD / Programmer a fighting chance to both set up a sophisticated look and evaluate the stage in front of them at the same time. Shows were not only programmed by the LD but were busked live using more complex fixtures and equipment than was previously available. Having this grid of tiles laid out in front of them, the more visual operators started laying out their grids in a graphical way that reflected the stage or venue itself. Back light was placed at the top of the screen, Side at the, er, sides. The Magic Sheet was reborn as not only a tool for recalling numbers but an interactive selection method that was more intuitive than ever before. This Magic Sheet method of laying out Groups on a tiled touchscreen window is still used by many programmers using the above consoles today and even palettes are often saved to tiles in a visually ordered fashion to make instant recall easier. It would be churlish to discuss the Magic Sheet and modern lighting control systems without mentioning the Jands Vista. 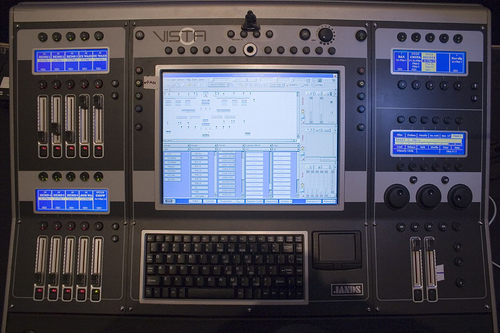 Many software-only disco lighting controllers use the visual approach to laying out fixtures for selection but the Vista is an example of a console designed with professional users that offers the opportunity to layout patched fixtures and select them using a user-designed graphical UI. Working with the Vista, one trick is to understand the Magic Sheet concept for fixture selection and avoid the natural instinct to lay out the kit out as a rig plan. The thing about a rig plan is that it denotes where the kit is hung, not what it does or where it ends up and it groups fixtures according to their hung position instead of their colour or designed function. This is completely the opposite to a Magic Sheet which describes what things do for the show and ignores rigged positions as a method of classification. The difference in emphasis is similar to that of the Lee Filter’s Designer’s Edition gel swatch book against the Numeric. One is creative, the other technical. Another key to laying out the UI on the Vista is to remember that your fixture selection is often going to be best done with the stylus and touchscreen using a marquee (you know, that selection rectangle thingy that PCs use). This is preferred to Shift + Clicking multiple sporadic icons but does mean that two-dimensional consideration must be given to things that can be selected in groups using a rectangle or in pairs using a narrower vertical or horizontal drag without picking up unwanted fixtures too. The tactic is to set out clumps of fixtures in such a way that make sense of their uses on stage or rough geography and without slavish recreation of the rig plan. Part of this is also leaving sufficient “white space” (gaps) between groups and even between sub-groups of fixtures so that all or a part of the useful group can be selected. This ties in with good practice in moving light programming in which you “herd” large numbers of fixtures around before picking off smaller groups and only then selecting individual units for tidying where required. One final note is the difference between conventional lighting and moving lights in the way we think of them. A Magic Sheet with all conventionals will likely be laid out based on where the units are focussed or their purpose whereas the moving kit can be focussed in different places and be used for multiple purposes throughout the show. In this case, moving lights are more likely to be found laid out with a greater emphasis on their rigged position. Using the Cham Sys MagicQ and it’s touchscreen(s) interface, there are a few ways in which you can create an intuitive and visual programming environment. This is especially true if you happen to run additional touchscreens along with the console. The Groups window always displays every tile, whatever the window size which means that the geography of the recorded groups will change if you change from Max to Half to Quarter. Pick whichever window size you like for your Magic Sheet and record the layout along with other windows as a Saved View. Saved Views will always return to the window settings when recalled including the scroll. This means that you can have different sheets or layouts of the Groups window. One for Max Magic Sheet and one for Quarter List. The first could have G1 at the top left, the second could have G200. This tip is also useful if you are running a lot of different fixture types. I often have a Saved View that zips to the Media Server groups or Spots or Washes etc. in the Group window. If you want to select multiple Groups in one series of stabs, you might need to check the Setup / View Settings to enable this. You can then toggle particular groups on and off with a press. You can use Move or Copy to create order in your Magic Sheet. Don’t forget you can insert multiple copies of a group if that makes your sheet more useful. You can also create a group with only 1 fixture in it for ease of selection without resorting to the command line. If you have followed the Slow Start Cham Sys MagicQ tutorials, you will be familiar with how to use a Grid to put together a version of the rig plan for simple visualisation purposes. Choose your grid size and insert fixtures into it in a similar manner to that which they appear in the roof. 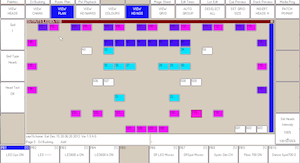 This grid is set up and used in a version of the Output window called View Plan. If you didn’t already know, we can also select multiple fixtures using this plan once View Grid has been unchecked after building the layout. Knowing more about Magic Sheet concepts, it’s not hard to see how to put together some ideas on a grid that use individual fixtures in clumps that are ready for selection, similar to the Jands Vista. 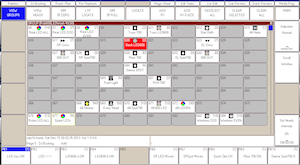 MagicQ supports multiple grids that are used in different contexts including when pixel mapping internally, designing Execute layouts and also our fixture selection Magic Sheet in the Output Window. Simply select the grid number, give it a width and height and insert your fixtures. Again, you can insert duplicate heads in more than one grid slot which can be useful depending on how you organise your layout. The output grids can display tiles in a number of different ways including by colour, Name and Head No. too and you can create one rig plan and several magic sheets if you wish. The MagicQ responds to a few different methods of fixture selection in the Output window including dragging, shift+clicking and there are details in the User Manual of row and column selection too. Once selected, fixtures parameters can be adjusted on the fly by holding the relevant attribute button and using the encoders before letting go of the button returns the view to the Magic Sheet. Further experimentation for Magic Sheet style selection and operation can be made in creating Execute window layouts (grids again) which can house Groups, Cues, Macros plus the interaction can be individualised with a choice of buttons, faders, colours and shapes to press and swipe. A background image can be inserted using Set Wall Paper in the Execute View Design mode (the View Exec window is the one you run it in). You can also create buttons for special functions including to jump to another *Exec window. If all that is making your head spin or if you are lighting shows with a Tempus M24 then let’s pull it back again to where we started: The Magic Sheet. Even when dealing with 24 channels, there is no harm being able to more easily recall the numbers for plotting particularly when using a traditional keypad numeric entry desk. Do an image search and look at the Theatrical Lighting Database and take a look at how other LDs have formatted their magic sheets. Then get a sheet of paper and some marker pens and go nuts. Have you got anything to add? Any tips on how you format your magic sheets or how you use the Magic Sheet concepts for setting up your lighting console of choice? Come on over and put your comments in the box below. * The Exec window on the MagicQ is where some programmers like to spend time getting creative with the interface. Many consoles have their own particular areas where the hardcorse users hang out. With the Hog it used to be the creation of custom lib.lib files, in old Avo land the writing of custom personality text files. Grand MA junkies delight in making screen layouts and writing highly complex macros and the Exec window on the MagicQ is where fans release their inner nerd.